Here at Prime Stables, we know the importance of appropriately preparing a field for your horse. The field in which your horse is kept can have a big effect on his physical health and mental well-being. Therefore, careful consideration should be taken over the preparation of your horse’s field. Below, we have listed the process of preparing a field for your horse. We hope you find it useful and, if you have any further questions, please do not hesitate to get in touch. When preparing your field for horses, it is best to ensure safe and secure fencing is installed. Fencing is essential in any equestrian field as it helps to minimise injury to horses and reduces the risk of horses straying from the pasture. Hedging alone is rarely enough to keep a horse in a field and a sturdy fence is usually required. Here at Prime Stables, we enjoy working with wood as it is sturdy, reliable and a natural resource. However, you can purchase various fencing materials, ranging from wooden to plastic, electric to tape and plain wire to mesh. We would recommend, however, that when choosing to fence you consider how permanent it will be as this may indicate which material will be best to buy. Gates are an essential addition to any field. Otherwise, your horse will be fenced in with no way out. Field gates need to be at least 3.6 metres wide and should open inwards for safety. We would highly recommend metal gates as they are lighter and easier to maintain than other materials. With metal gates, you also have the option of adding a mesh on the lower half of the gate, preventing horses from putting their legs through the rungs and getting stuck or causing injury. The pasture should be appropriate for the type and number of horses it is going to sustain. 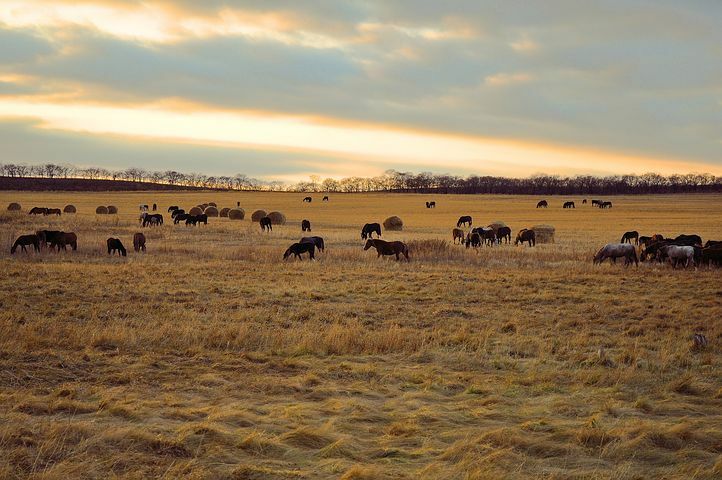 The ideal pasture would have a good mix of grasses and herbs, providing a thick cover that will help protect the ground from being churned up by horses’ hooves. A standard recommendation for pasture size is that it has a minimum space of 0.4 hectares per horse. However, addition land may be required to allow for effective rotation of grazing. Here at Prime Stables, we always check our pastures regularly for the appearance of poisonous plants. If we find any, we take measures to control them so they do not pose a risk to our animals. As any horse owner will tell you, water is essential and fresh, clean water should always be made available to your horse from containers free from sharp edges and which are easy to keep clean. We would also highly recommend that you ensure enough water is available for the number of horses in the field to access easily. Natural water sources, such as streams and ponds are not a recommended water source as they risk contamination and are often difficult for horses to access safely. Field shelters are essential and, here at Prime Stables, we specialise in them! When preparing a field for your horse, provision of a shelter is extremely important as it provides your horse with protection from the elements and shade from extreme sunlight. Here at Prime Stables, we offer a range of field shelters. We have a wide range of budget mobile field shelters for horses available, and can deliver and install nationwide. Your shelter can be towed from field to field, thus reducing the need for a field shelter in every paddock. Whichever type of field shelter you use, it should be positioned correctly in the field so that it provides protection from the weather, while also located in a well-drained area of the field. If you require more information, here at Prime Stables we are experienced and qualified to answer any questions you may have. Grass is an important energy, fibre provider and nutrient for your horse and it is essential that your pasture provides this. Make it a priority to maintain the health of your horse’s pasture. Vitamin and mineral supplements may also be required to help increase the value and health of the grass. Loose hay can be dispersed around the paddock or held in safely tied hay nets. During the winter, or for horses in heavy work, hay and additional hard feed may be required to make up for the lower feed value of grass. Field rotation also helps immensely in maintaining the health of fields. Here at Prime Stables, we have decades of experience in horse stables and care. We hope this article has been informative and that it has helped educated you on how to effectively prepare a field for pasture. If you would like any more information, or if you have any questions, our team at Prime Stables are available to offer any services or advice should you need it. Simply, give us a call today!